Starform Outline Stickers silver: 1268. Starform Glitter Stickers silver: 1004, 7043, black: 1139. Cut of the front of the card diagonally. Cut a black square (11x11 cm) diagonally in half and attach one piece to the card. Place a silver metallic rectangle (9x12 cm) inside the card. 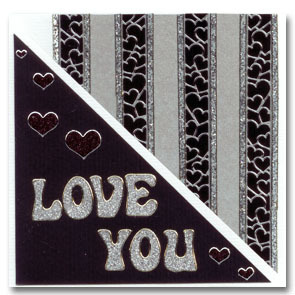 Place 4 ribbon-stickers on black paper, cut them out and place them inside the card. Add the glitter border stickers. Finally add the text and the hearts.